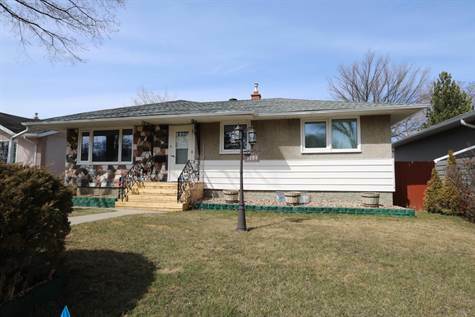 Garage: Triple, Detached "2 Garages Double/Single"
Basement: Yes, Full "1 Bedroom Suite"
Excellent 3 + 1 bedroom, 2 bathroom fully developed bungalow with non-regulation basement suite plus newer double garage (22 X 24) 8 years approx. & a single garage (12 X 21) with new overhead door. Upgrades include newer PVC windows on main floor, high efficient furnace/approx. 4 yrs, new central air (requires hook-up), shingles on house/1 yr, deck/1 yr, upgraded main floor kitchen (All appliances included). Spacious livingroom with large upgraded picture window, refinished hardwoods and is open to diningroom with crown moulding and hardwood flooring. Kitchen includes upgraded cabinetry/countertops and stainless appliances. There are 3 bedrooms on the main floor and a 4 pc bathroom. There is a separate backdoor entrance to the non-regulation 1 bedroom open plan suite with appliances included, 3 pc bathroom & walk in bedroom closet. There is a laundry room in the basement that is shared and outside the suite. Large parklike backyard/6,998 sq. ft with mature landscaping & raised deck, 22 X 24 newer garage, 12 X 21 single garage with new overhead door. Insulation and drywall for new garage will be included/not installed.